Pompeii was still in the Roman Empire more than 1,800 years ago. In 62 AD the first great disaster hit Pompeii, a terrible earthquake. Although the city was left in rubble, the surviving citizens set about rebuilding and soon restored the city's industrial and commercial activities, using the opportunity to expand as well. As the city was being rebuilt the second disaster struck. Probably August 24, 79 AD started out much like any other day for the prosperous and sunny town of Pompeii, Italy. But looming 4,000 feet high, just a mile away from town, was the volcano Vesuvius Though Vesuvius hadn't erupted in hundreds of years, it did so abruptly on that day." 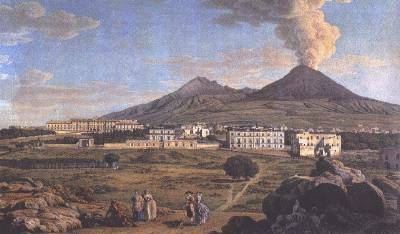 The sudden eruption destroyed the towns of Herculaneum and Stabiae, but covered Pompeii with a soft 30-foot layer of volcanic ash. The Roman historian Pliny described the explosion as "a black and dreadful cloud now and again yawned open to reveal long fantastic flames." 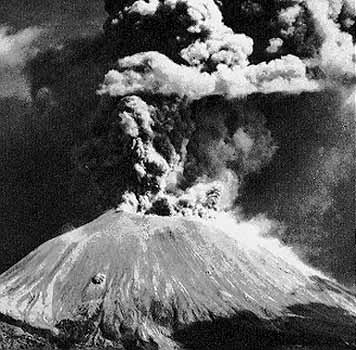 With a huge boom, a tall eruption column rose from above Vesuvius and Pompeii was bombarded with poisonous gas and fumes. Hot ashes, stones, and cinders rained down. The thickness of the debris increased up to six to eight inches per hour. Pumice stones up to three inches in diameter rocketed toward Pompeii at maximum speeds of 100 miles an hour, and very likely caused injuries and collapsed roofs. Archaeologist believe that some residents remained in their homes, in hopes the shower of debris would soon end. After seven hours of explosive activity, the eruption suddenly grew in strength, and the ash column grew higher in altitude. Debris fell for five more hours, and by the morning of August 25, about 1.5 yards of ash and pumice covered the Pompeii area. Then, the disaster situation took a turn for the worse. Avalanches of deadly pyroclastic flows raced down the slopes, destroying everything in their paths. 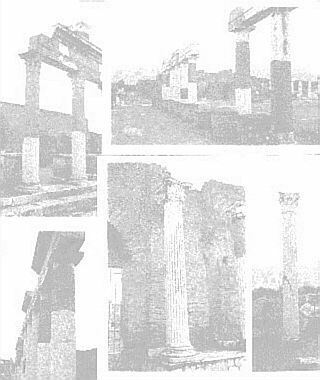 The Roman town of Pompeii was totally destroyed. It should be noted that this is very similar to the eruption of Mt. St. Helens in Washington State in 1980. No one around that volcano believed that it would erupt, either. After the explosion, Pompeii was literally forgotten, and was buried in 30 ft. of soft volcanic ash for centuries. When it was finally discovered, archaeologists found remains of 2,000 victims out of the 20,000 population of Pompeii. It took 1630 years before the ruins of Pompeii were discovered by accident, when an Italian workman dug a well on Mt. Vesuvius's slopes, and he dug right into Pompeii's ancient Roman theater. Three years later they had finally hollowed out the inside of the buried building. No one will ever know if the theater looked just as it did on the day that the ash covered it because the excavators took almost all of the valuable art, sculptures and furnishings. After that find, historians began to wonder exactly what had happened to Pompeii. For forty years after that, the mountain was searched for clues to uncover the mystery of the lost city. Due to a discovery by a Spanish engineer in 1748, the greatest story in the history of archeology began. Unfortunately, many of the excavators had no idea what they were doing, and they were only in it for the profit. Much of what they found was sold to museums and private collectors, so what they found in the first buildings remains a mystery. A systematic excavation of Pompeii began in 1763, more than 160 years after architect Domenico Fontana rediscovered it while building an underground aqueduct. Pompeii, located near present-day Naples, was wonderfully preserved, giving historians a clear glimpse into the life of the Roman people. Pompeii also contained reminders of those who perished in 79AD. To see a little more about the people and their way of life that archaeologists have uncovered, click on the image below. Or, to return to the Pompeii main page, click on the icon below. To learn more about volcanoes and their geography, just click on the image of the earth to go to the Geology Room.